CGT's Paris was built by Chantiers et Ateliers de St. Nazaire. Although she was laid down in 1913, her launching was delayed until 1916 and she was not completed until 1921, due to World War I. 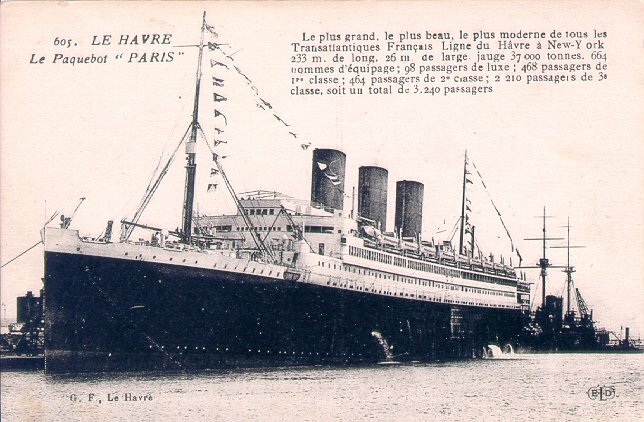 When finally completed, she was the largest liner under the French flag, at 34,560 tons. 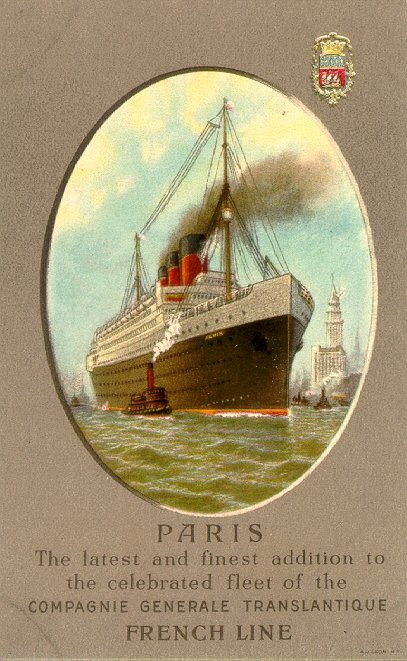 Paris made her maiden voyage, from Le Havre to New York, on 15 June 1921. 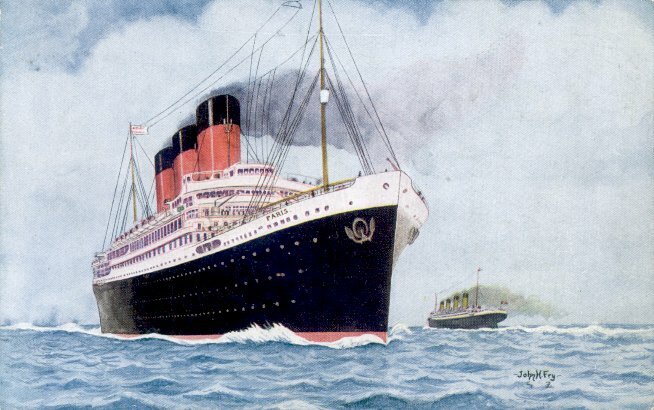 A 1929 fire, which broke out while she was at Le Havre, ruined her passenger accommodations and required six months of repairs. On 18 April 1939, again at Le Havre, Paris again caught fire. This time, though, two people died and the ship's career was ended. 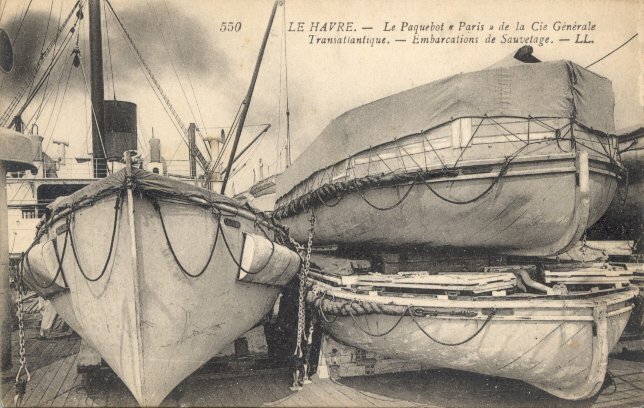 As a result of the amount of water pumped into her, Paris fell on her port side, trapping Normandie in a nearby dry dock. She then sank into the mud in her dock. After her funnels and masts were removed so Normandie could leave dry dock, the hulk of Paris remained in place throughout World War II. 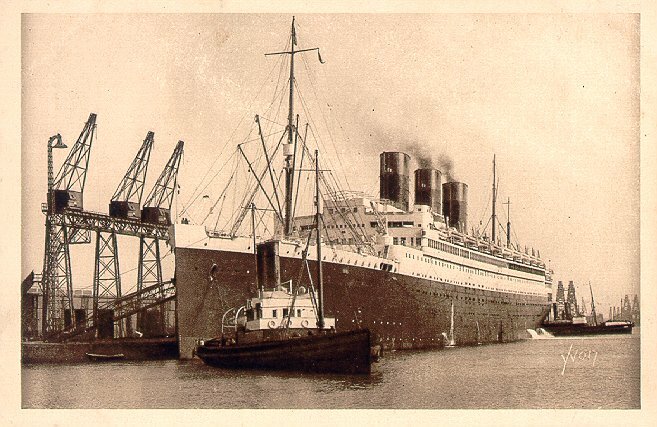 She was still there in 1946, when Liberté (ex-NDL Europa) broke loose in a storm and sank after hitting the wreck. Liberté was raised and eventually entered French Line service, but Paris was dismantled on the site in 1947. The emblem in the upper right corner of the bottom card below is the coat of arms of the city of Paris.